Neumann Goretti is the king of the Catholic League. And the queen as well. 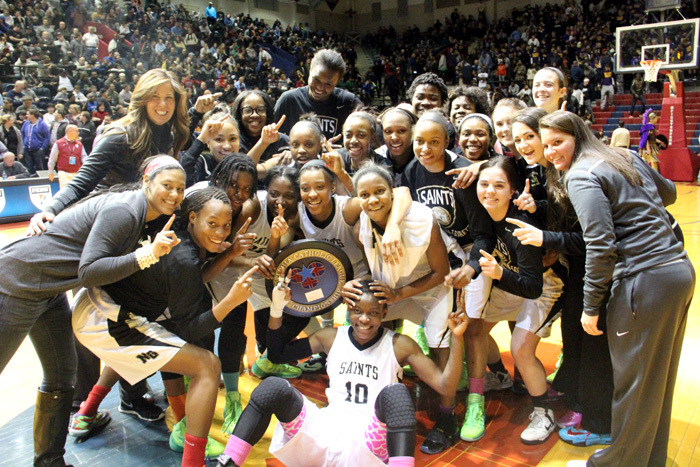 In a riveting championship doubleheader Monday night at the Palestra, the Neumann Goretti girls outlasted Archbishop Wood, 55-46, for their first Catholic League title since 1978. About three hours later, the N-G boys stopped Roman Catholic, 53-48, to capture their sixth consecutive crown. This is the first time in 46 seasons that the same Catholic League school won both basketball titles in the same season; Cardinal O’Hara pulled the rare trick in 1968. No one more than Alisha Kebbe, who nailed three three-pointers and finished with 17 points. Along with dynamic point guard Ciani Cryor (12 points) and forward/center Ella Awabajo (10 points), N-G raced to a 21-11 lead after the first quarter before the Vikings (20-3 overall) regained their footing. With sophomore Bailey Greenburg and senior Rachel Day both reaching double digits with 17 and 12 points, respectively, the Vikings climbed to within 41-39 with 26 seconds left in the third quarter and then 44-43 with 6:22 remaining in regulation. But the undefeated Saints (24-0) clamped down on defense the rest of the way. In the boys’ contest, Roman Catholic (now 21-4 overall) entered with a perfect 15-0 league record and was attempting to win its first title since 2007. The Cahillites led 33-28 in the third quarter before the Saints (also 21-4) scored the next 10 points to go ahead, 38-33. N-G never relinquished the lead, giving coach Carl Arrigale his eighth title in 10 years and 10th altogether, tying former Roman coach Dennis Seddon with the most career titles. Senior star Ja’Quan Newton, a University of Miami signee, scored a methodical 23 points, set up several other buckets and grabbed key rebounds. Classmate Jamal Custis netted 12, including the first six of the game, and senior Troy Harper added 10 more. For Roman, senior guard Rashann London led with 22 points. Look for more coverage of the league championships later this week.